Ubi Franklin has spoken after Waje complained about the situation of things in Nigeria’s music industry and worried she might have to quit music (read here). Ubi Franklin hinted that it is not easy for an individual to be a singer and run a Label. ‘Waje works really hard I have been in different studio sessions with her, she won’t leave that studio if the song doesn’t sound right or she gets wheat she wants. Mel B has confirmed an intimate 25-year-old rumour about herself and fellow Spice Girl, Geri Halliwell. 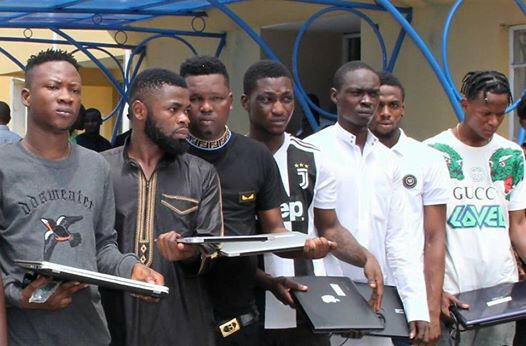 #jaiyeorie Operatives of the Economic and Financial Crimes Commission, EFCC, Lagos Zonal office, have arrested 11 suspected internet fraudsters for offences bordering on conspiracy, possession of fraudulent documents and attempt to obtain money under false pretence. Beyoncé and Jay-Z's 7-year-old daughter gave her grandmother, Tina Knowles Lawson, a small chuckle on Sunday by telling her a “corny” joke. Queen B’s mom shared a video of the little lady’s comedic routine on Instagram. Tina captioned Corny joke time with A special guest!! Singer Becca slaying in a Fendi sweat suit flaunting her baby bump shared a picture with a letter to her little baby Becca. She says nothing would come in between the love she and the hubby have for the baby. The 30-year-old Grammy and Oscar-winning singer and 28-year-old Oscar-winning actress hit up the gay bar Pieces in New York City, where they took part in some drinking games, hosted by drag performers. “Jennifer, this isn’t the Hunger Games!” joked one of them, Brita Filter, as seen in a video posted by the Daily Mail. “I volunteer! I volunteer!” a patron shouted. “If Jennifer wants to come and play, she’s more than welcome,” the performer said. Musiliu Akinsanya aka MC Oluomo, made this known on his Twitter page . Oyedepo Preached As Landmark University Clocks Eight; He words; “You can never be a solution provider if you don’t think. Thinkers of all ages are solution bearers. There are many readers but few thinkers. Unfortunately, only 5 per cent think, 25 per cent think they think while 75 per cent will rather die than think. Nigerians on social media, have reacted to a replica of NYSC jungle boot made by shoe-making company Converse.The boot is one of the iconic symbol of the National Youth Service Corps. The replica of the NYSC jungle boot had been advertised by a Nike apparel store and it didnt take much time before Nigerians noticed the extreme similarity between the shoes and that of the National Youth Service Corps. Leo’s tweet on cultism which got deleted few minutes ago, got the attention of Noble Igwe who in the comment section wrote ‘If I’m you, I won’t tweet this’. WASH Gala has become one of the most highly anticipated annual events in the African diaspora community. The 10th Annual #WASHGala took place on Saturday, March 23rd at Guastavino’s in New York, NY. WASH community development organization working to strengthen water, sanitation and hygiene (WASH) infrastructure and services in rural communities across sub-Saharan Africa. 10th Annual #WASHGala in NYC on Sat. March 23rd, 2019 Osas Ighodaro Ajibade ,Audu Maikori,Oluchi,Ty Hunter attended the event. An Nigerian artist drew DJ Khaled son, Asahd Tuck Khaled. North and Penelope set up the Yeezy pop-up stand yesterday in Hidden Hills. True, Khloé, Saint, and Kim were spotted at the Yeezy pop-up stand in Hidden Hills. KKW Beauty founder takes to Instagram Stories to highlight her daughter’s latest venture: a lemonade stand.North West is following in the footsteps of her business-savvy parents, Kim Kardashian and Kanye West. Jordyn Woods is back on Instagram and now she's making moves in these Hollywood streets. The 21-year-old stepped out for dinner at Craigs with YouTube star Justin Roberts and her momager Elizabeth Woods. She stepped out in black velvet two-piece that she paired with black stockings and black pumps. Jordyn put in work on the set of Justin Roberts' new music video, "Way Too Much," which is set to drop on April 12th, which just so happens to be Khloe Kardashian's daughter True Thompson's birthday. Jordyn 21, former bestie of Kylie Jenner, a month past her exile from the Kardashian-Jenner family due to a cheating scandal with Khloe Kardashian’s now-ex Tristan Thompson, has a surprising new project: She stars in 16-year-old YouTube star and singer Justin Roberts‘ upcoming music video, “Way Too Much,” along with fellow social media influencer Sofia Jamora, 21. The song is a homage to young stars in the spotlight of social media and the consequences when fame becomes “Way Too Much,” E! News has learned. The video has a “Toy Story meets The Matrix” vibe and the women play life-size dolls who are assembled and packaged in a toy factory, and then make a daring escape from captivity. Rosemond Alade Brown otherwise known as Akwapim Poloo has revealed that her colleague Kumawood actress Tracey Boakye has a penchant for small boys. Yemi Alade reveal this video online with caption.